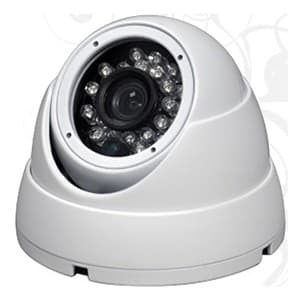 The SYSPRO-D16Q is an infrared dome HD DVR camera system that includes sixteen 1080p HD infrared surveillance cameras (AHD / TVI / CVI / CCTV), a hybrid 1080p HD / CCTV DVR, pre-made video/power cables, and power supplies. The SYSPRO-D16Q 1080P HD CCTV dome cameras that are included with this system have a 3.6mm fixed lens that provides a 90 degree horizontal angle of view. This view is ideal for ceiling mounting in the corner to capture a room's entirety. The infrared capability of the camera supports zero light video surveillance and has an effective range of up to 15 meters / 50 feet. Here are the main features of the DVR included with this surveillance system. You can learn more about the iDVR-PRO16A here. All iDVR-PRO HD DVRs can be found here. If you are thinking about upgrading the DVR included with this system, you can refer to this iDVR-PRO model comparison chart to help decide. Here are the main features of the HD-Q3 1080p dome security cameras that are included with this system. You can learn more about these 1080p weatherproof dome cameras here. You can also see a video demonstration of the HD-Q3 here. Sixteen sets of 100 foot premade Siamese cables are included with this system. These cables allow you to run both video and power to your camera. If you need to extend your cable run longer than 100 feet, you have two options.